Astronomy has shown us striking images of galaxies, star clusters, and vast glowing nebula. But for many scientists, that is not where the excitement lies. For astronomers who study the chemistry of the cosmos, the most intriguing discoveries are found in the light itself. Spikes and dips at specific parts of the spectrum tell us what kinds of atoms and molecules are present in stars and the places where they form. Radio telescopes are especially powerful astrochemistry tools and able to tease out the faint, telltale spectral signatures of atoms and molecules in space. 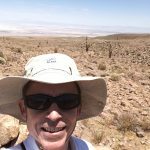 And none has done more to help our understanding of the chemistry of protoplanetary disks than the Atacama Large Millimeter/submillimeter Array (ALMA). Protoplanetary disks are rotating bands of dust and gas around young stars. These regions are more than just planet factories; they also are chemical cauldrons brewing up complex organic molecules that could eventually lay the groundwork for life elsewhere in the cosmos. But how does that happen? What sorts of chemicals actually form around young stars? And, how do they eventually end up as part of newborn planets? To help answer these questions, ALMA studied a rather unusual protoplanetary disk around the young star V883 Orionis. This star is not typical: it has a mass a bit larger than the Sun, but is putting out 400 times more energy! It recently experienced a powerful, but temporary increase in brightness – an event that heated the inner region of the disk. This burst of heat and energy did just what you would expect it to do; it melted away the icy coatings on the grains of dust in orbit around the star. 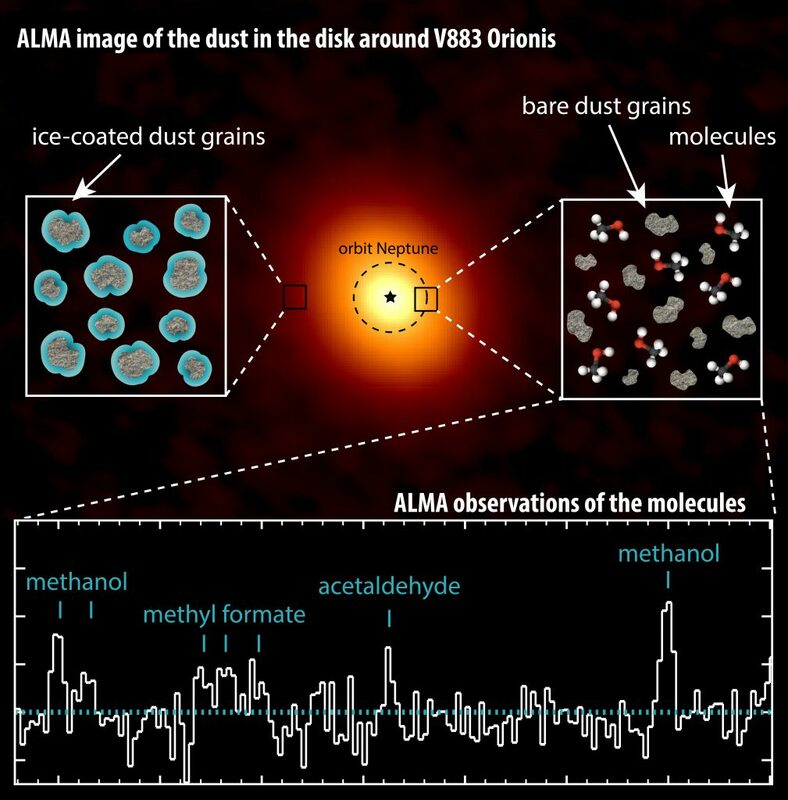 Normally, the temperatures, particularly in the outer regions of most disks, are so low that molecules — such as water, methane, carbon monoxide, and more — remain frozen as ice layers on dust grains. Heating these particles – like during V883 Orionis’ period of extraordinary brightness — releases all the molecules into the surrounding space where they glow, ever so faintly, in millimeter-wavelength light. That is where ALMA comes in. This extraordinary telescope can both detect and pinpoint the location of these molecules, showing us the chemical complexity of icy bodies in planet-forming environments and aiding our understanding of when the building blocks of life are formed and how they get incorporated into nascent planets. Complex organic molecules, the precursors of prebiotic molecules, form very efficiently in ices in cold, dark interstellar clouds. But until now, only two specific molecules – acetonitrile(CH3CN) and methanol (CH3OH) — have been detected in mature protoplanetary disks: those that are tens to hundreds of millions of years old. The outburst of V883 Orionis allowed us, for the first time, to observe the chemical complexity in a planet-forming disk, in two independent studies – one led by Merel van ‘t Hoff (Leiden) and the other by Jeong-Eun Lee (Seoul). Besides methanol, molecules like acetaldehyde (CH3CHO) and methyl formate (CH3OCHO) are also observed around V883 Orionis. When V883 Orionis returns to its normal brightness (no one is really sure when that will be), the complex molecules will again freeze onto the dust grains. Some of these icy bodies will form comets, the building blocks of young planets. Complex molecules locked in the comet’s ice mantle may eventually end up crashing onto the planets, possibly seeding the formation of life. Follow-up studies will show whether even more complex molecules are present, and maybe even whether the simplest biomolecules, like the amino acid glycine, which has been observed on comets, can already be present before planets have formed. The author acknowledges and thanks John Tobin and Merel van ‘t Hoff for their editorial contributions and collaboration in writing this post.